IDBI Executive Salary : Industrial development Bank Of India (IDBI) is one of the fastest growing banks in india. IDBI is one of the most secure jobs in India is to work with IDBI bank as it offers great experience and bright options to employees. The Industrial Development Bank of India (IDBI Bank) was released a vacancy for IDBI Executive Post. 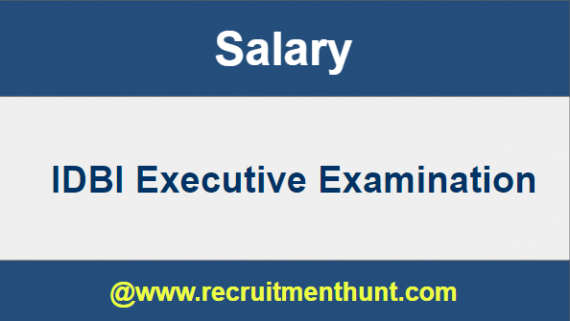 Aspirants who are appearing for the IDBI Executive Examination should have an idea about IDBI Salary , IDBI Salary Structure, Job Profile and Career Growth. Aspirants who are eagerly waiting to join Banking Sectors, this is an great opportunity to secure their dream job. IDBI is going to release IDBI Recruitment 2019 Notifications soon. So, Aspirants who are ready to apply for the IDBI Examination should have an idea about IDBI Slaary Structure, IDBI Job Profile, IDBI Promotions and IDBI Career Growth. Here we are providing the complete details about IDBI Salary which includes all the basic information which may help aspirants before applying for the examination. Here candidates can check IDBI Executive Salary, IDBI Salary Structure, IDBI Allowances and other Benefits, IDBI Jo Profile and IDBI career Growth etc. IDBI will release the IDBI Executive Online Application Date. So, Candidates have to know about IDBI Executive Salary Structure before going to apply for the IDBI Executive Exam 2019. To attend IDBI Executive Exam 2018 aspirants need admit card for that purpose here we upload the download process of IDBI Executive Admit Card 2018. Now, aspirants can easily download IDBI Executive Admit Card 2018 with the given information once it is released. In this Section we are going to explain salary in details. This post on IDBI Executive Salary, Job Profile, Promotion, IDBI Pay & Career Growth will, hopefully, clear all your queries regarding the same. Knowing these features are important as it will help you decide if you want to work in this post. An executive will be eligible to get Rs. 17000/- per month. In the second year of his job as an executive, a person will get Rs. 18500/- per month. There are two different types of executive posts available in IDBI. Here we have explained in detail. Customer service Executive (CSE) Aspirants will have to handle the front desk. A CSE has to deal with operations such as carry out all non-financial requests, like contact details updating, sol change, cheque clearance, transfer of funds, clearing of bank suspense accounts at EOD etc. This Job profile also includes the work of assisting the Assistant Manager. A teller service executive has the job responsibilities same as a Bank Cashier. The candidate is responsible for handling Teller counter. Finally candidates can check IDBI Executive Salary, Allowances, Job Profile & Career growth here. So, applicants can make their preparation easier by following IDBI Executive Syllabus. Download IDBI Executive Exam Pattern along with IDBI Executive Previous Year Papers through this article. Also, for more job updates subscribe and stay tuned to our website RecruitmentHunt.